A new year arrives and with it time to think back and contemplate–sometimes drawing up lists. Lots of best vampire movies, hottest vampires, most badass vampire flicks etc. 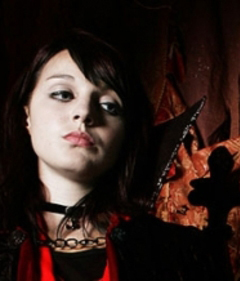 popping up so why not drop a list of the Top Ten Lady Vampires on T.V.? Why not indeed? In no particular order here is one such list, noting only the characters not the actors portraying them. 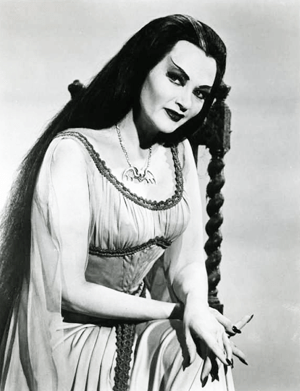 Lilly Munster from The Munsters, not quite the earliest member of this list but the first from American television. As the daughter of a distinctly yiddish Dracula and the bride of a goofy, charming Frankenstein’s Monster, Lilly became a perfect twist on the sitcom housewife and mother. Instead of a dog, her family had a pet dragon. Instead of tinkering with a radio, her father liked to mix potions and shapeshift. Her husband had a steady nine-to-five job, in a graveyard. This list has a couple of shows that added more than a few entries. Top of that would have to be the Joss Whedon programs Buffy the Vampire Slayer and Angel, which combined gave us three of the most memorable vampiresses of all time. Vamp Willow tops that impressive list, an alternate timeline version of our favorite ubergeek transformed by undeath in a sultry sadist turned on more than a little by meeting her other self. Yet we can hardly ignore Drusilla, a raven haired madwoman with prophetic powers and a penchant for dolls. She came across as the wonderfully entertaining hybrid of Ophelia and Hannibal Lecter. Add to this Darla, introduced in the first series but then returned to life and given a fantastic new storyline in the spinoff. Likewise True Blood gave the viewers quite a cast of undead characters, many of them female and just as interesting as the men. Two in particular stand out. First we met Pam, former madame and loyal deputy to a thousand year old viking, the queen of snark and sultry grand dame of the club Fangtasia. Part of the fun of her character remained the wonderful reactions she had as things went wrong–a combination of shallow annoyance and startling nobility coupled with ruthless self interest. No matter what one thinks of the storylines each season, Pam remained fun to watch. Equally so, but in a totally different way, proved Jessica the “baby vamp” sired by Bill in the first season whose story had all the hallmarks of a teenager finding herself. Which she was. But with fangs and drinking blood and stuff. In the 1960s the BBC did their first (of three) adaptations of Bram Stoker‘s novel Dracula. For that hour-long version, Lucy Westenra began already bitten and transforming before our eyes, fascinated by their new foreign neighbor with the exotic name. After death, she arose as a genuine wild siren, both alluring and repulsive. Unlike other versions, she sought out neither her fiancee nor children as her victims but initially bit her best friend Mina! That her fangs bore a distinct resemblance to those of Count Orlock in Nosferatu added to her vividness. 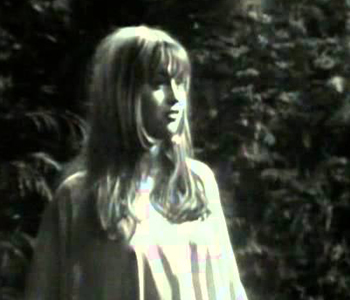 Not long after, the American gothic soap opera Dark Shadows created a well-loved plot twist involving the recurring villainess, the jealous witch Angelique. As punishment for her failures, the powers of darkness made her a vampire. That storyline lasted months and saw her claim more than a few Grooms of Darkness, including her beloved Barnabas Collins. The BBC made its second Count Dracula in the late 1970s, a much longer adaptation with a Lucy Westenra this time even more sexual in some ways, literally licking her lips in anticipation of feeding but capable when needed of looking like the same sweet, fun girl (as opposed to woman) she had been before. Instead of a seductive demon, this Lucy resembled an animal, even to the way she writhed and screamed as the stake pierced her heart, blood red eyes burning and fangs snarling! This list began with a sitcom, and now ends with one. Young Dracula gave one complex story after another, including one of the most fascinating vampires ever seen–the teenaged Ingrid Dracula, ignored and devalued eldest child of the Count. Eager to prove more evil than anyone else, she schemed as best she could and proved quite adept at it. Yet she had a soft spot or two. She saved a family who had given her a gift out of sheer generosity. She fell in love with “Breather” (derogatory term for living human being). Promised to spare a therapist when she came to power, out of simple gratitude. Openly and proudly cruel, she never stopped seeming vulnerable and we never quite stopped rooting for her. Your mileage may vary. Who would be on your list?